Warren McShane is Deputy Inspector General for External Affairs Religious Technology Center, holder of the trademarks of Dianetics and Scientology. 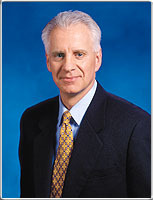 A member of the Church since 1973, Mr. McShane served in a number of administrative positions in Scientology churches before becoming a director and officer of RTC. Key to RTC’s role as the protector of the Scientology religion is the use of intellectual property law to ensure the purity of Scientology’s religious technologies. During his lifetime, Scientology founder L. Ron Hubbard oversaw the orthodox practice of Scientology. As an integral part of that endeavor, he registered as trademarks many of the religion’s identifying words and symbols. In 1982, he donated these trademarks to the Religious Technology Center. In 1983, Mr. McShane assumed responsibility within RTC for seeing to the continued protection and correct usage of the marks worldwide. Its continued work in protecting the scriptures of the Scientology religion has placed Religious Technology Center at the vanguard of preserving intellectual property rights the world over. © 1999-2004 Religious Technology Center. All Rights Reserved.